Getting in the Groove is the easy, up-to-date, multicultural, non-threatening, timely, and fun way to teach creating and improvising through drumming. This exciting curriculum covers drumming across the globe, from West African to Taiko styles. You do not have to be a drummer to teach this book. 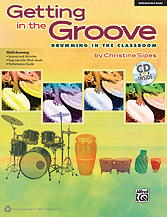 All rhythms and examples are on the CD for easy teaching and use in the classroom. Getting in the Groove addresses all types of learning styles and aligns with current teaching methodologies, as well as the National Standards for Music Education. Reproducible Worksheets, Quizzes, and Assessments are included.